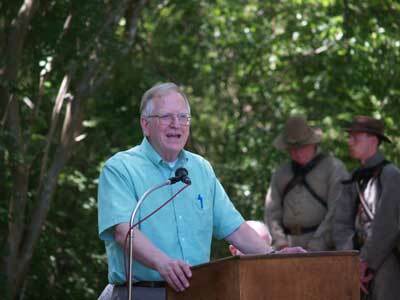 Speech delivered by Grady Howell, Jr. at the unveiling of Sid S. Champion’s Confederate Headstone on May 20, 2006. Grady Howell Jr., Mississippi writer and historian, pays tribute to Sid Champion I at headstone dedication. Confederate headstone for Sid S. Champion, Co. "I", 28th Miss Cavalry unveiled at the Champion Family Cemetery, Midway Station, Mississippi. One-hundred and forty-three years ago, the residual effects of that battle, forever named the Battle of Champion Hill, made this area a hotbed of activity. Four days previous on May 16, 1863, during the horrific struggle between the massed forces of Blue and Gray, the very ground that we are standing on rumbled and shook, convulsed from the explosions of thousands of cannon balls and hissing of tens of thousands of Minié balls and was drenched in the blood of hundreds of American fighting men. The story of but one man’s heroic death on this field, that of Capt. Samuel J. Ridley, of Madison County, serving in Co. A, 1st Regiment Mississippi Light Artillery, is alone worthy of a book, but we are here today to honor the man, Sidney Champion I, husband, father, planter and soldier of a martyred Cause, whose very home place gave the South and the Nation a worthy name for a battleground both will long remember - Champion Hill. My Lord, even Homer could not have asked for a more appropriate name for a contested field. Each of these words on their own denote dominance! Though lost as a footnote to the Siege of Vicksburg and Battle of Gettysburg, this is a near-sacred place where the destiny of our very country, as it exists today, was decided five generations ago! 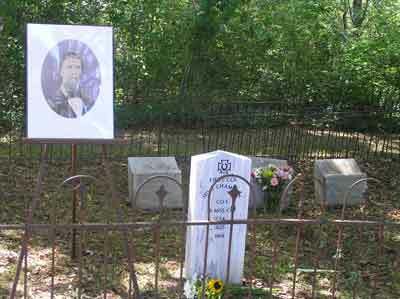 We hope the nation never forgets this geographic spot, this Hallowed Ground! Let us, however, return to the centerpiece of the occasion for which we are gathered here today. That is, Sidney Smith Champion I, who died in 1868 at the age of forty-five. Life is such a fleeting thing - the first eighteen years of one’s life drags on painfully slow - then one looks up and he or she is at what today we call mid-life - then, not-so-slowly, we begin to feel the “leaves drop off our tree of life.” We all would like a little bit of immortality after we are gone from this rotating planet. “To live in hearts we left behind is not to die!” states the adage on more than one country cemetery tombstone. Sid Champion was no different. While others were content to simply live each day, he wanted to experience life to its fullest - and he did. His life was a rosary of tears, both joyful and sad. He was a man who cherished knowledge and he was a soldier in two wars, the Mexican War and Civil War. He did not become a “professor of high degree” as he wanted to be; nor was he a great architect in the development of our country, or even an author of books (for whatever value that may be). But he was a private in one war and rose from lieutenant to lieutenant colonel of the 28th Mississippi Cavalry in another war, and he did leave behind a very interesting chronicle of his observations and thoughts in a number of personal letters that have been carefully edited and published by two of my very favorite historians and friends, Margie Bearss and Rebecca Drake. Regretfully, after the war with his fortunes and health destroyed, like many of his contemporaries, he experienced a melancholy demise, an untimely death, and now rests beneath our feet until the Lord Triumphant returns! His story could very easily have been lost to posterity if not for the workings of his good wife. Nature tells us where the inner strength of man lies and that is in the love of a good, true woman. Scarlett O’Hara be hanged - Matilda Champion’s story of love and survival represents the true fabric of our Southern legacy! It is because of her efforts that we are here today to honor the memory of her beloved husband, Sid. Sid, we appreciate your life; Matilda, we love you for preserving his memory! I close with the verse of one of the South’s most wonderful poets. A poet whose very name used to roll off the lips of countless Southern children, but sadly no more, Father Abram J. Ryan. If you are not familiar with his work, I urge you to reacquaint yourself with it before it is lost forever and another piece of our wonderful Southern Culture is lost! And bright with the deeds of the down-trodden just. Yes, give me a land that has story and song! Enshrine the strife of the right with the wrong! Shall yet be a rock in the temple of right. Copyright (c) Grady Howell, Jr.. All Rights Reserved.